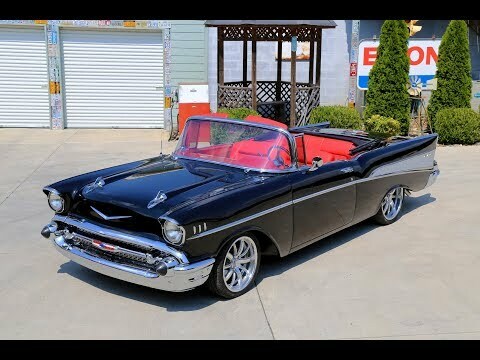 Up for sale we have a 1957 Chevrolet Bel Air Convertible. This car was set off the frame when restored and had multiple upgrades done during the restoration. We've pictures and multiple receipts to document the resto. Both inner and outer quarter panels were changed. Down the sides are straight and all the gaps look great. Everything is covered in the Onyx Black paint that has been buffed and polished to a deep rich shine that's slick as a ribbon. The top on this Convertible is Power and has had a new Black Canvas top installed. Every piece of Chrome and Stainless on this Bel Air is either new or in Like new condition. The glass was all replaced along with the seals and window felt. You'll notice the side glass is smoked which gives the exterior a killer look! To finish off the exterior it's sitting on a set of 18” and 20” Polished Raceline Wheels with new tires. On the inside, it's equally impressive and the Custom Red Leather interior provides a phenomenal complement to the exterior. It has the factory bench seats that are done with custom Leather covers that have a suede accent and new padding. The door panels have the same leather and suede combination, and the kick panels flow perfectly with the door panels. In the trunk you will also find a the matching leather and suede combo. Looking at the dash it's painted red along with the tops of the doors. It has new instruments from Dakota Digital that are all working. The radio has also been upgraded and is working. This Bel Air does have Vintage Air Condition with the controls being in the factory location and the vents added under the dash. To complete the interior, it has the Chrome Tilt Column and Banjo Wheel. Under the hood of this Bel Air sports a ton of Chrome and Polished Aluminum. It's powered by a 350 Crate Engine that's set up with a Chrome Edelbrock Intake and Holley Carb. The engine is mated to 350 Turbo Trans and the stock style rear end. To go along with Air Condition this Bel Air also has Four Wheel Power Disc Brakes with the drilled and slotted rotors. It also has Power Steering with a 605 Gear Box and to keep it cool it has an Aluminum Radiator. For exhaust, it has Headers with Duals Pipes and Chambered Mufflers. When you look under new brakes lines along with new fuels line and a new tank. When the frame off was done new floors were installed and they were painted body color. The frame was also done in black and new body bushings were installed. If we can help you in any way with questions or a specific picture, you can call our office at (865)988-8088. Or feel free to call Daniel at (423) 807 0600, Devvin at (865) 256 2366, or you can e-mail us at smokymountaintraders@yahoo.com.